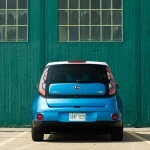 Soul EV brings to the table a fantastic blend of all-electric motoring with very little compromise. You see a lot of hybrid electric vehicles on the streets of Toronto, a lot of them on duty as taxis in the downtown core, where the fuel savings have ensured the disappearance of pretty much all the V8-powered Ford Crown Victorias of yesteryear. The hybrid formula allows for full-day usage, with the electric motor working alongside the gasoline powertrain to provide an infinitely flexible solution that just works for a lot of people – no fuss required. The full-electric car theory hasn’t really taken off (save for the Tesla Model S), because of one thing: range anxiety. The vast majority of people living in an urban environment don’t actually drive very far to get to and from work. Even though today’s electric cars can handle most commutes, people shy away simply because they don’t have the same freedom they’re accustomed to with a traditional gasoline-powered car. 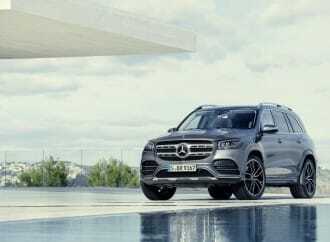 People are too used to filling a tank with gasoline, and being able to go where they need to go, untethered for 500km, before they have to visit another gas station. Hybrid electric vehicles work best if you can understand how they work, and understand how to extract the most out of them, but will happily return you decent efficiency numbers, even if you didn’t care or change your driving habits one bit. 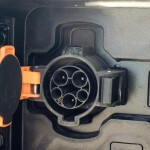 Battery electric vehicles (BEVs) require a much larger lifestyle change and commitment. 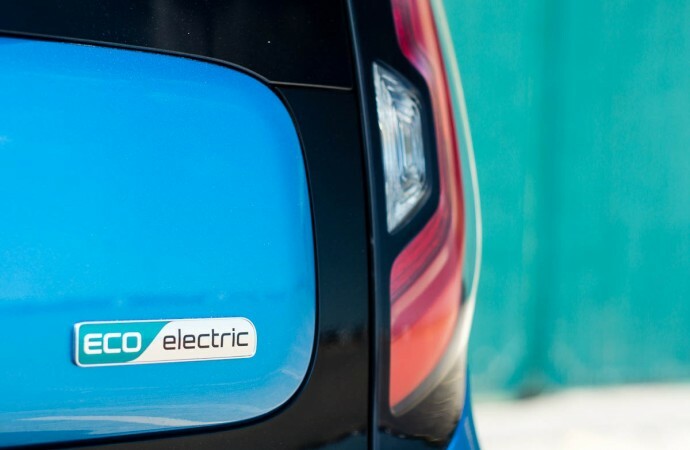 Hybrid electric vehicles are a more popular avenue for automakers to go down, because they are a better fit into more lives for the reasons mentioned just above. 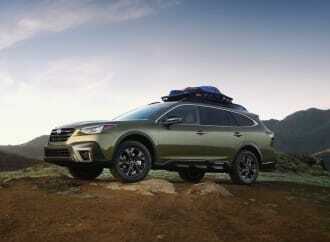 Kia has the Optima Hybrid (similar to the Hyundai Sonata Hybrid), and then there’s always the suite of Hybrid Synergy Drive products from Toyota. 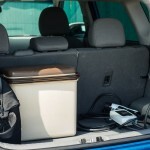 BEVs are more specialized, due to the much larger reliance on the capacity one can realistically cram into the vehicle. 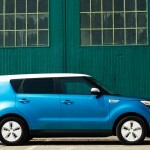 I was a little intrigued when Kia introduced the Soul EV for the 2014 model year, because it wasn’t a purpose-built electric vehicle from the ground up, but rather a top-to -bottom retrofit of the existing gasoline-powered Soul. 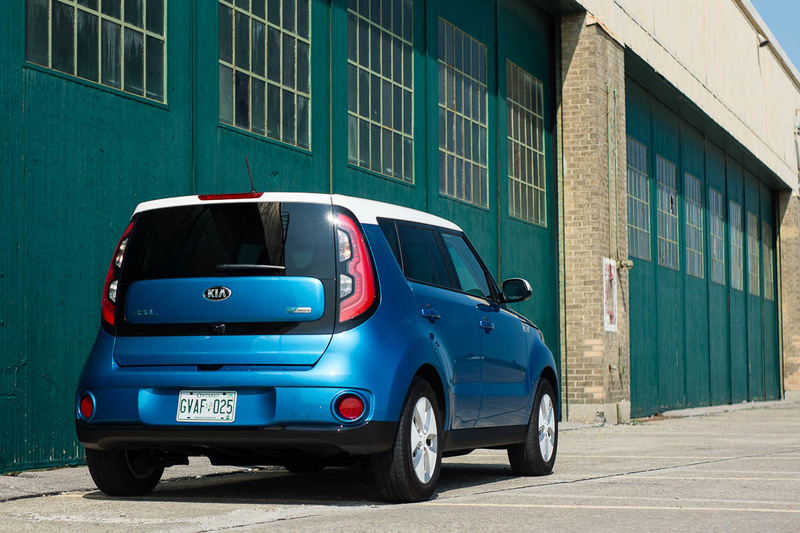 How would Kia manage to remove all the gasoline bits, and electrify its Soul? 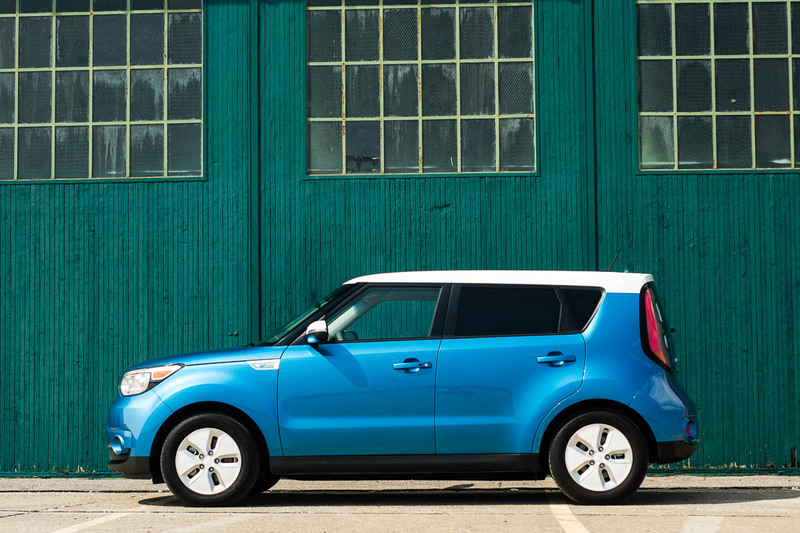 I brought a 2016 Kia Soul EV home for a week to see how it would fit into my usual, gasoline-filled lifestyle. 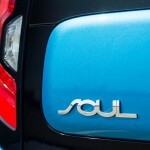 With no means for gasoline propulsion, could the Soul EV work for people? 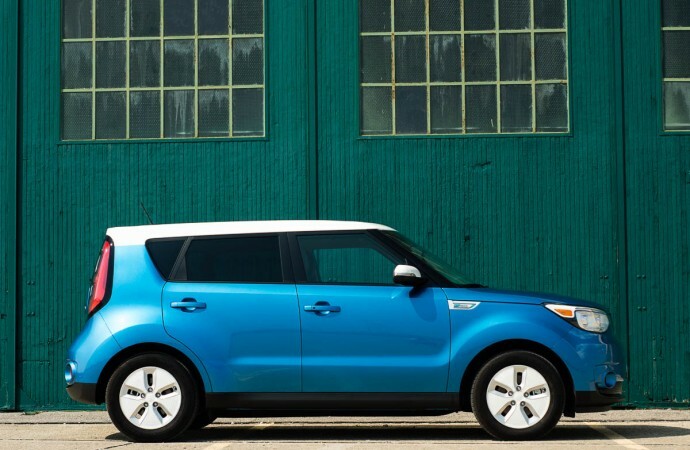 First thing’s first: it looks like a Kia Soul. I had the chance to review the Soul last year, and found it to be a properly funky city car, that also happened to be surprisingly usable, thanks to the squared off design. It may not be to absolutely everybody’s taste, but its polarizing looks is what gets the attention. 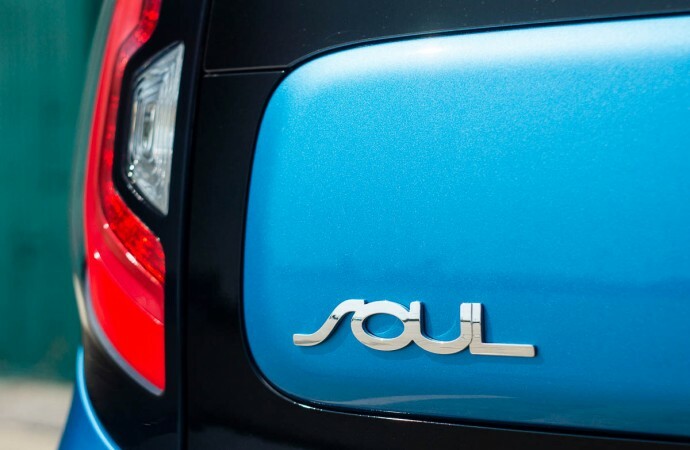 The Soul EV gets specific paint schemes, too. My tester was painted Polar White, on top of Electric Blue. 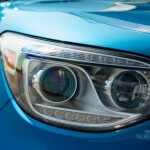 The Soul EV retains most of its unique style, but changes a few things due to the lack of gasoline engine under the hood. 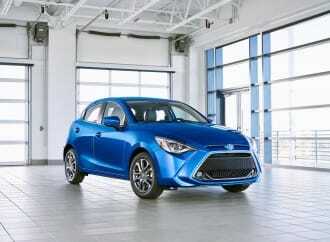 Up front, most of the grille openings are sealed up, due to the reduced cooling requirements. Kia puts the charging port(s) in between the headlights behind a spring-loaded door. 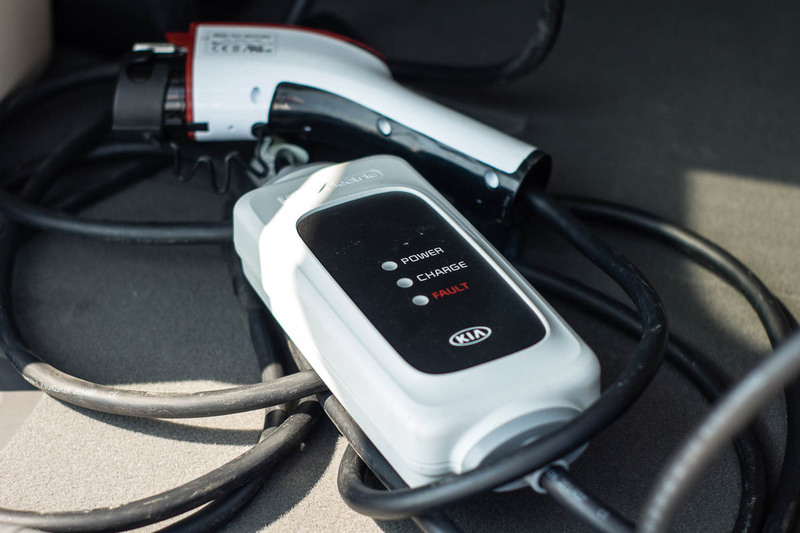 My particular tester features one SAE J1772 charge port – following the standard pretty much across the industry. 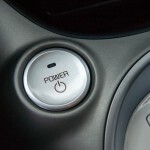 Many of the plug-in hybrid vehicles I’ve driven in the past put the charging port on the side of the vehicle. 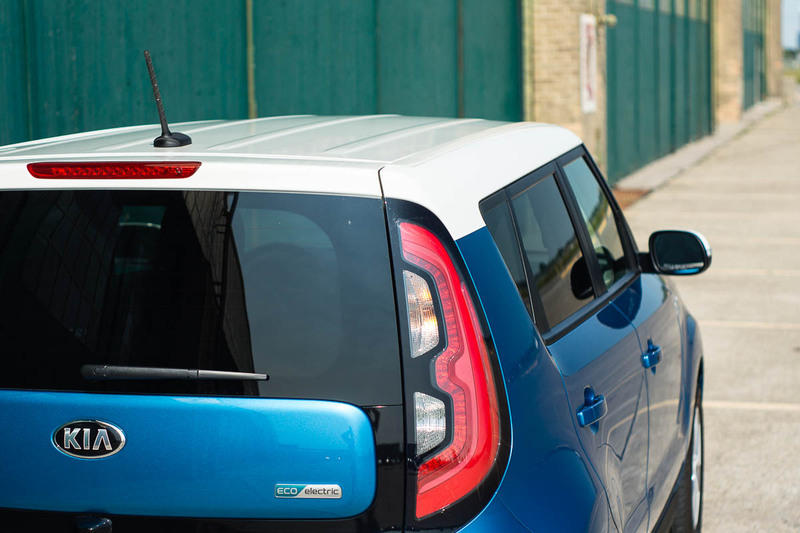 Other than the aerodynamic 16-inch wheels and funky colours, the Soul EV looks fairly similar to its gasoline counterpart. Inside, the Soul EV changes up things a little more. 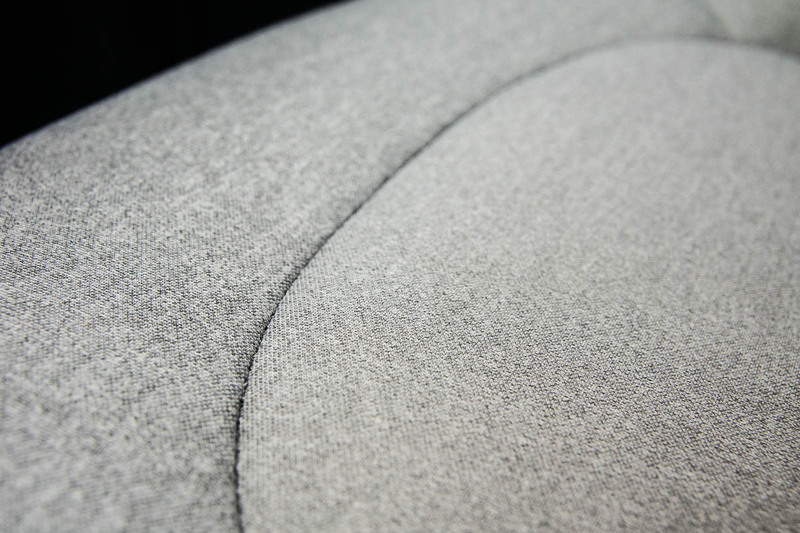 The standard cloth seats feature an environmentally-friendly material that remind me a lot of sweat pants – not a bad thing! 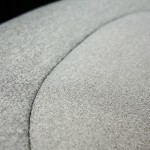 Things like the fabric headliner and carpet are also sourced from sustainable materials. All in all, the look may still mimic that of the traditional Kia Soul, but it’s what’s inside that counts. 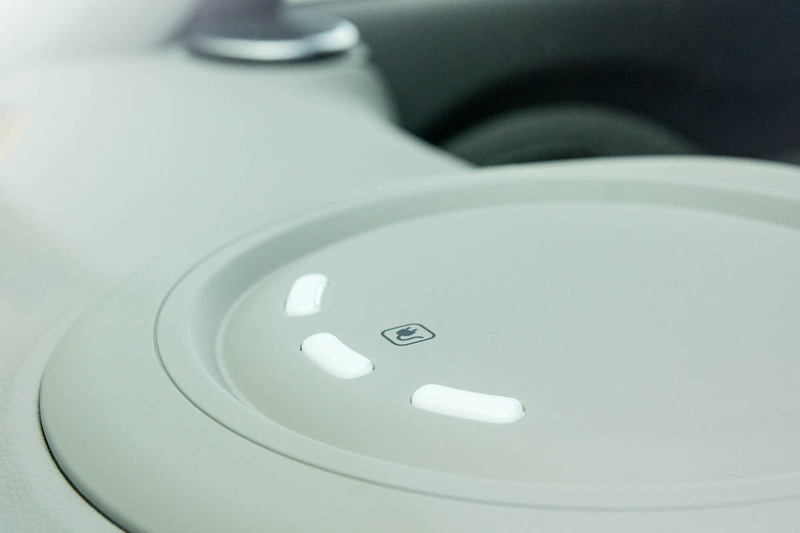 The Soul EV is well-equipped – with push-button start, satellite navigation, and heated seats as standard equipment. 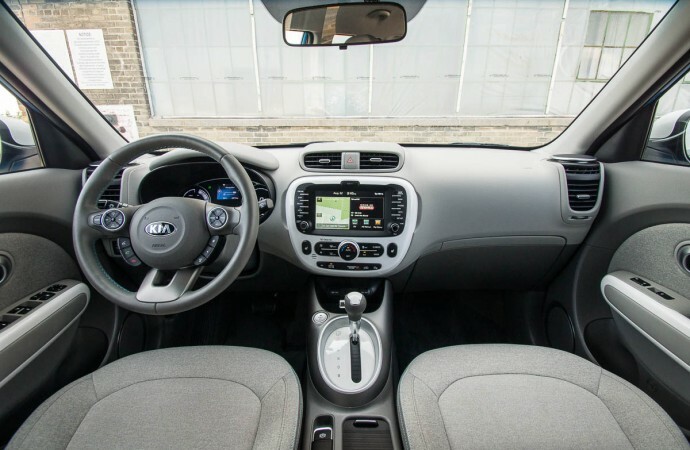 You’d think the standard satellite navigation was added by Kia out of the goodness of their hearts, but it’s actually integral to the change in mindset needed to get the most out of an electric vehicle. 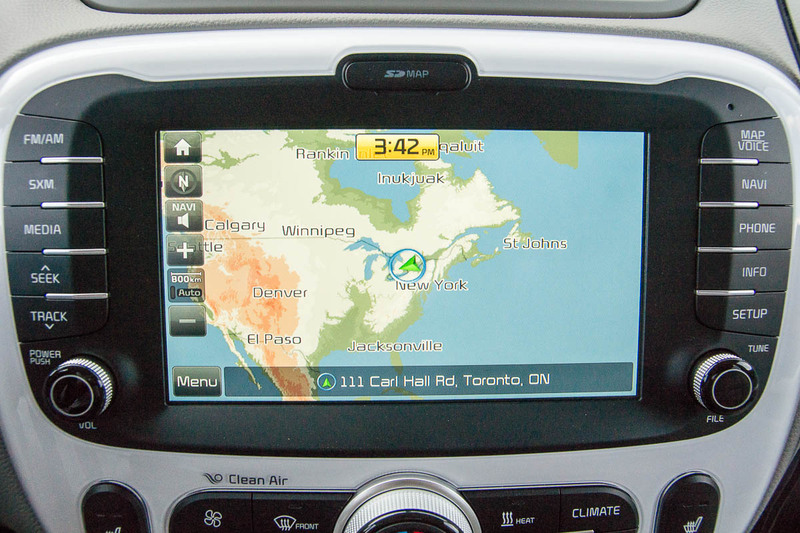 The navigation system, on demand, can point you to the nearest charge station – at least one with quick charge capabilities (instead of the usual household 110V). 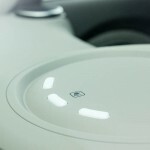 If you’re alone in the Soul EV, there’s a button called “Driver Only”, which may be worth enabling. 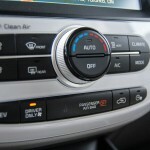 If you’re in need of heat or air conditioning, why waste energy heating up the entire interior? This “Driver Only” option closes off every vent except for the two pointed at the driver. 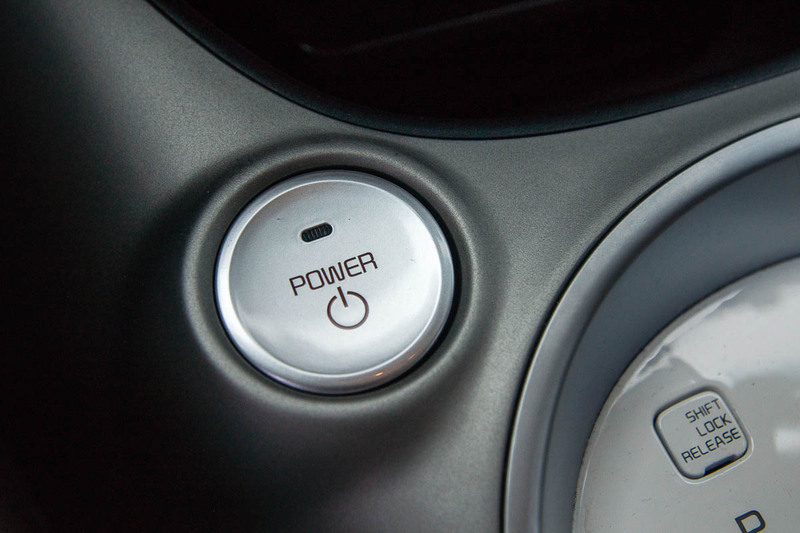 The heated seats are commonplace across the industry, but they play a more important role in electric vehicles. It is much more efficient to heat the seat than to scavenge heat from the electric hardware. Rear seat accommodation is surprisingly good, considering all the batteries and additional electric hardware stuffed under the rear seat and cargo floor. 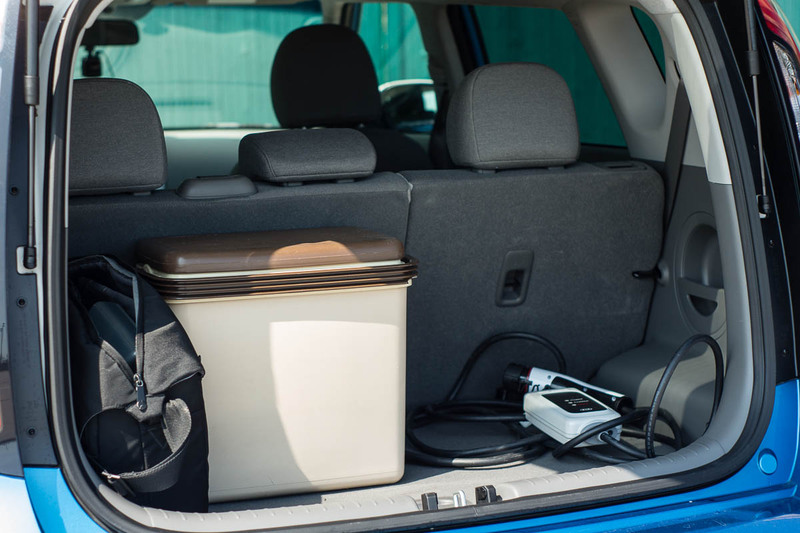 When you open up the rear hatch, you’re presented with a usefully tall area that isn’t compromised whatsoever by electric hardware. 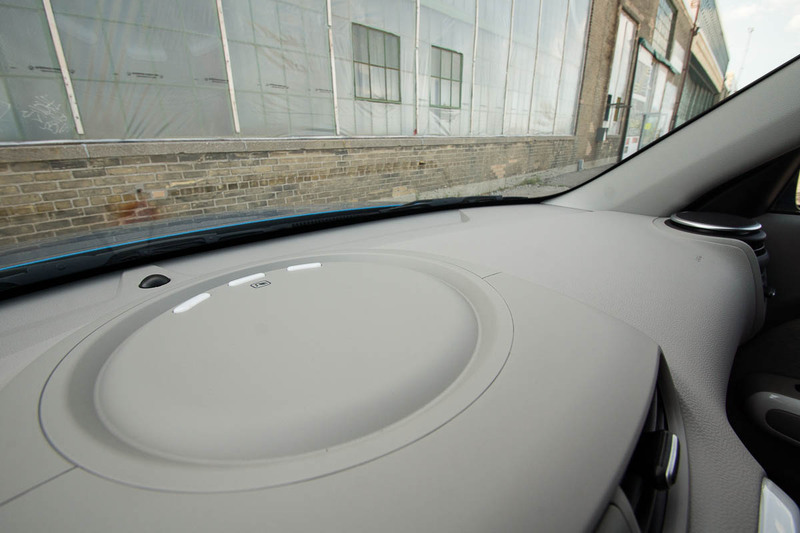 If you flip up the cargo floor, you’ll find space for the SAE J1772 110V charger that many other plug-in electric vehicles use. 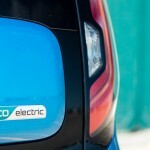 When you plug the Soul EV into an appropriate charge point, an array of three bright blue LEDs located on top of the centre stack will begin to flash (in sequential order), a lot like the small electronics you have around the house. When all three are lit and no longer flashing, the battery is at 100%. It’s an easy way to see what the charge is from a distance, but the practical downside is that these blue LEDs are extremely bright. They’re bright enough to light up the front of my garage and get some attention from my neighbours. Those dabbling in the desktop computer hardware arena will know how piercing some of these blue LEDs can be. I’d look into dimming them a little bit, myself. 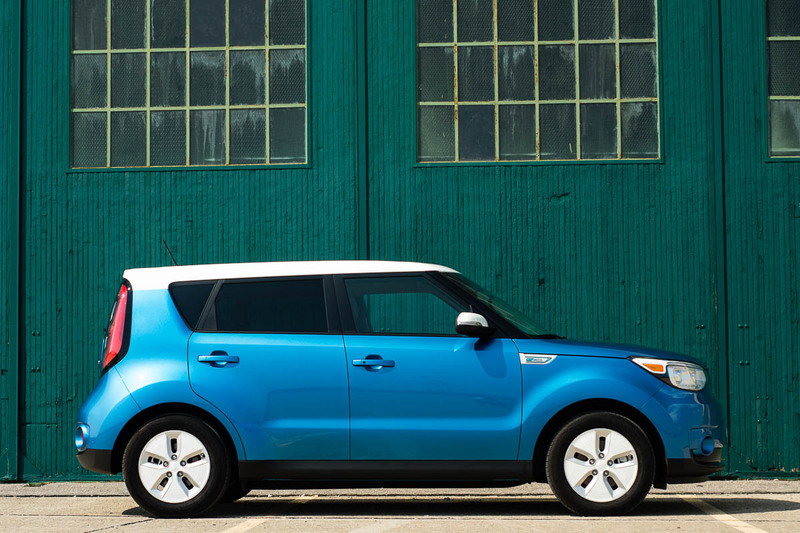 The Kia Soul EV looks almost like the ordinary Kia Soul. Other than the fairly modest interior changes, it looks the same. The big difference (if you haven’t clued in yet) with this vehicle is its complete lack of gasoline-powered motivation. This isn’t a gasoline-electric hybrid, or even a plug-in electric hybrid vehicle – it is purely electric. Under the floor, resides a heated 27-kWh, 360V, 192-cell lithium-ion polymer battery, rated to provide about 150km of total range. 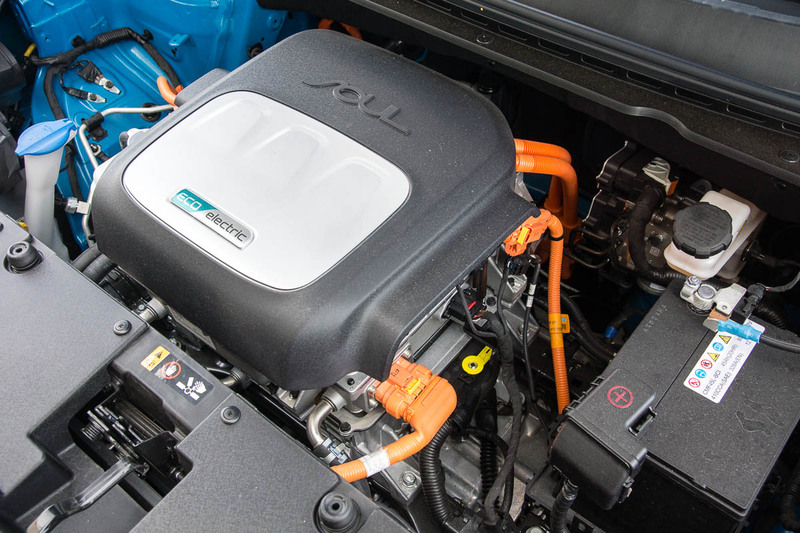 This feeds an electric motor under the hood, good for 109hp and 210lb-ft of torque, right from 0rpm. 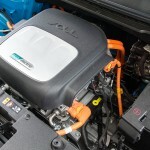 Even the electric motor underneath the hood somewhat resembles a gasoline engine. 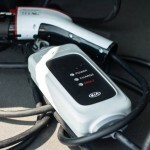 The benefits of all-electric torque are not new – hot cars like the Tesla Model S provide explosive acceleration that’s very different from even the most powerful gasoline-powered sports cars. Even in something like an Audi R8 V10, one needs to wind up the engine to extract peak power. 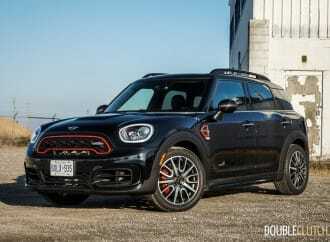 If you turn off the traction control and stand on the accelerator, the Soul EV will burn the tires right off in a show of hilarious wheelspin up until about 40km/h. 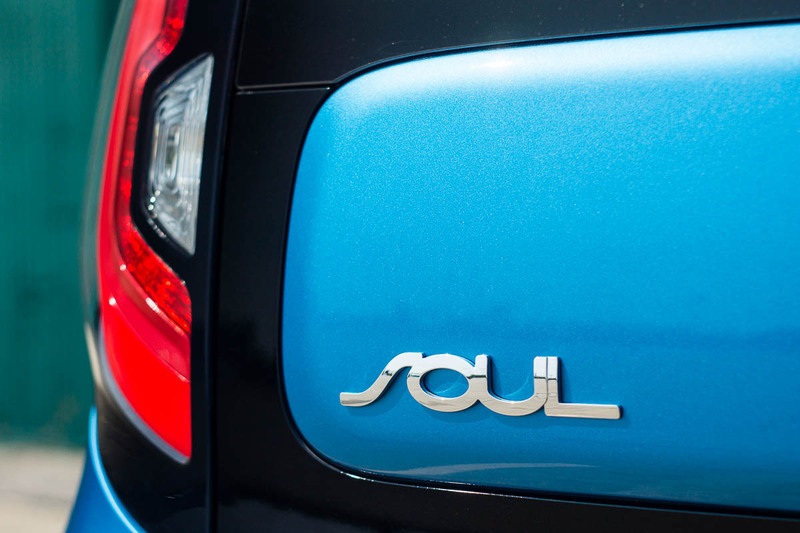 For tooling around the city, the Soul EV is surprisingly quick, thanks to its instant power delivery. 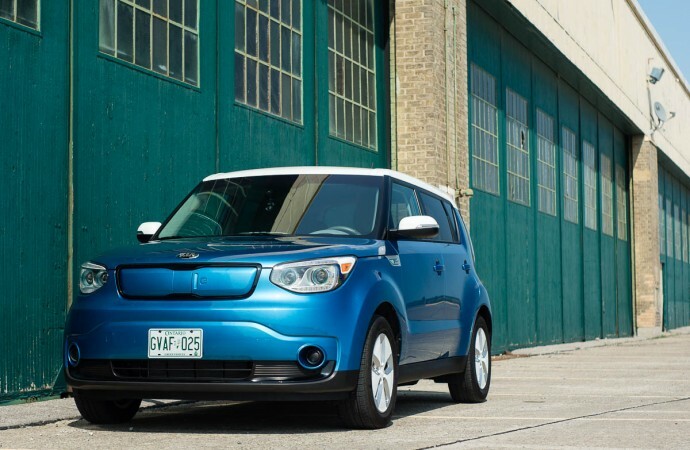 The Kia Soul EV provides interesting (and way more than adequate) acceleration from a stop, but what everybody asks about is the range provided by the battery. 150km doesn’t sound like a whole lot, considering people are nowadays able to fill up on gasoline and do almost 1000km before filling up again. 150km in one shot (from start to destination) is what people are used to thinking about when it comes to overall range, and this reflects negatively on what full-electric vehicles like the Soul EV can do. In practice, this 150km figure doesn’t drop in the same way it would in a gasoline-powered vehicle (one simply just doesn’t get gasoline back). 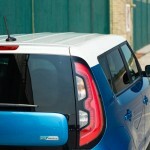 The Soul EV is capable of aggressively harnessing the kinetic energy of the vehicle in motion to recharge the battery. 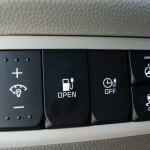 On the “gear” selector, the default drive position is “D”, as expected. 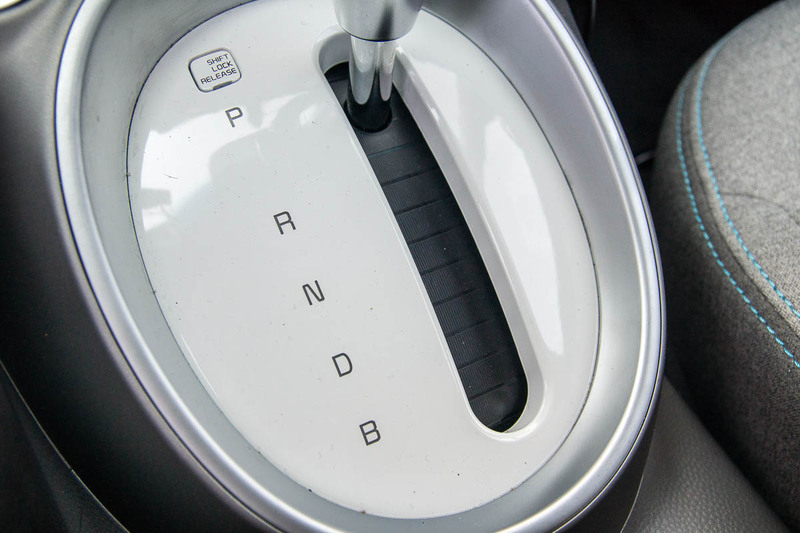 There is one more position beyond that called “B”, which activates a more aggressive regenerative braking program. 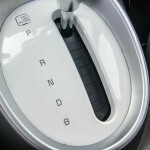 I actually recommend driving in “B” mode all the time. 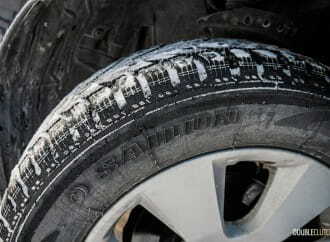 It takes a little getting used to – the braking sensation when you take your foot off the accelerator is quite strong. Once you’ve got the hang of it, you really only use the brake pedal to bring the Soul EV to a complete stop from about 10km/h. If you spend most of your time driving in the city, driving in “B” mode is definitely the way to go. In the real-world, range anxiety is a real thing. Current technologies haven’t quite allowed for BEVs to become the “primary” car in the average North American household. People enjoy their freedom a little too much, which will tie us to fossil fuels for decades to come. 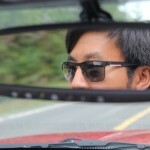 However, once I started to actually get behind the wheel of the Soul EV, the concerns I initially had mostly went away. My commute, door-to-door, into downtown Toronto, is about 23km. The route consists of a lot of stop lights, and not a lot of highway speeds. Driving in “B” mode, and regenerating energy where I could, it was genuinely surprising to see the range drop only 9km, to about 138km. It was more of the same on the (slower) commute home – total range used was only about 20km. 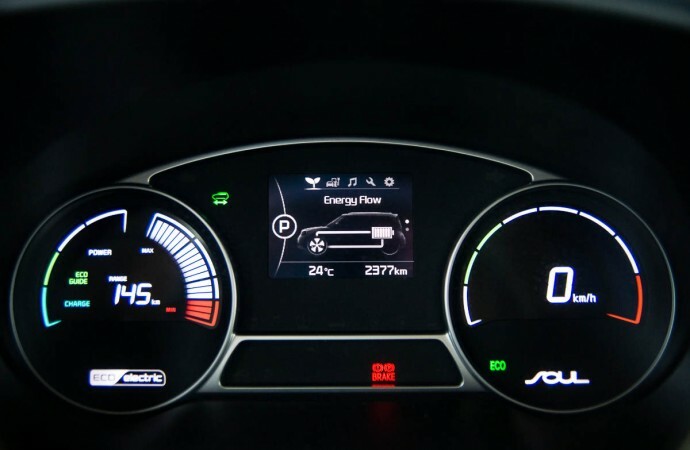 It’s important to note that these impressive consumption figures are obtainable in an urban environment – doing any sort of high-speed highway driving will see the range drop fairly quickly, as you’re fighting aerodynamics, and you’re not able to regenerate energy as often as you would in a stop-and-go environment. 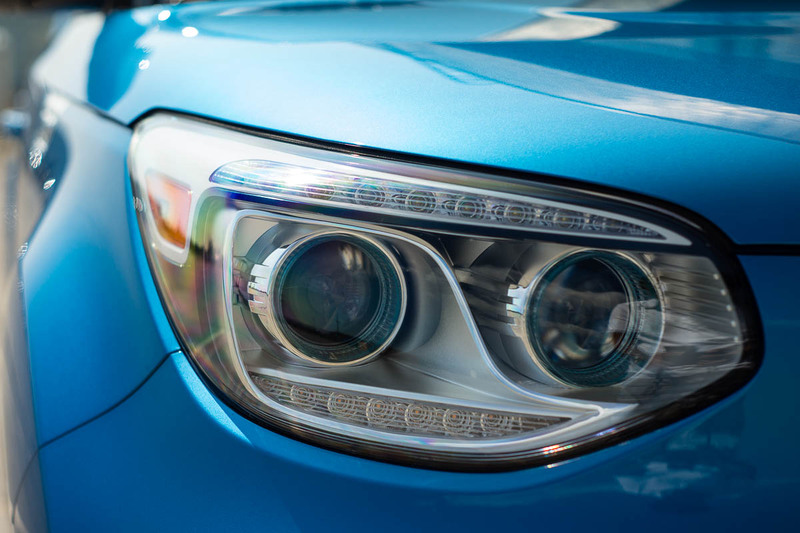 For quick highway stints, the Soul EV has enough reserve capacity to get you across the city, but it is happiest in lower-speed scenarios. 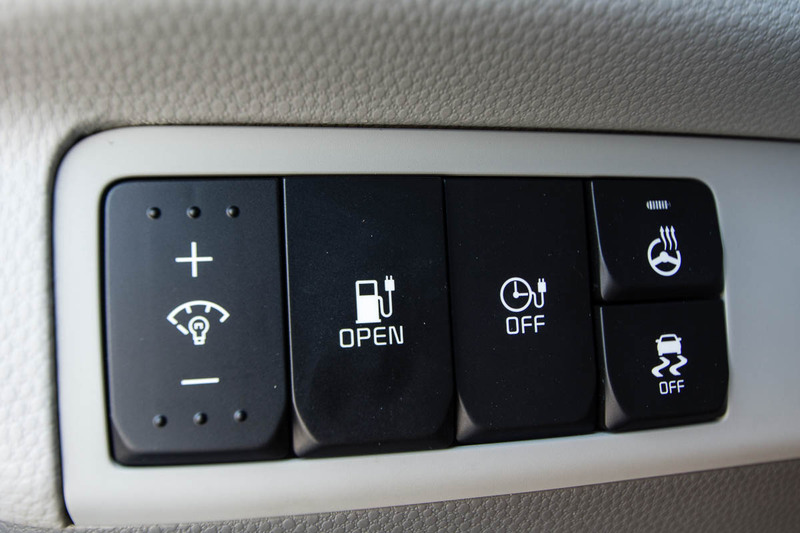 Your mind will also be at ease – seeing the available range drop so quickly can’t be good for driver confidence. Throughout my week with the Soul EV, not once did I even come close to running the range down to 0km. Thankfully, my commutes to and from the downtown core were such that the car could be plugged into the 120V outlet in my garage overnight. Charging at 120V doesn’t quite reach 100% over the span of eight hours, though. One evening, my plans happened to be very close to a local CAA office, in the suburbs. So, I parked the car there, plugged it into their (complimentary) higher-speed 240V outlet, and had a friend pick me up for dinner. The battery easily reached 100% in the 3 hours it was plugged in. 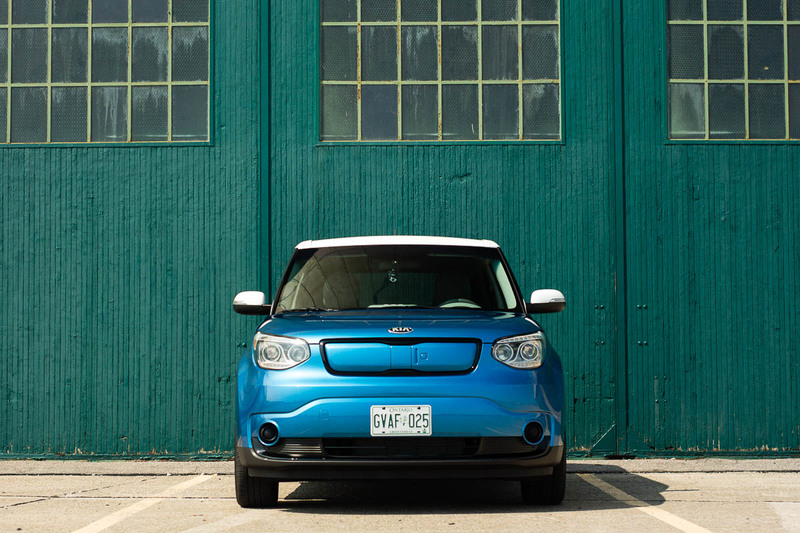 The Soul EV has many of these high-speed charging stations mapped out in its satellite navigation system, so it’s just a matter of finding the outlets, which are sometimes hidden behind buildings or in the corners of parking lots. 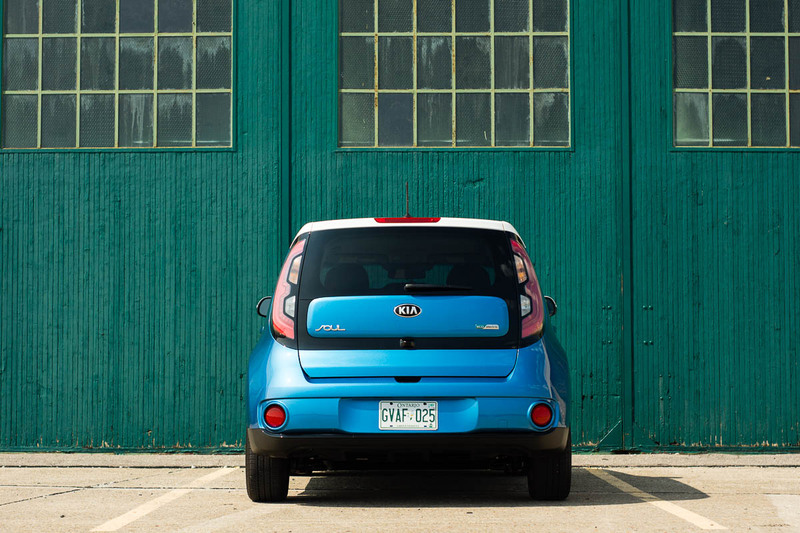 For what it’s worth, Kia Canada rates the Soul EV at 2.0Le/100km (litres equivalent) in the city, and 2.6Le/100km on the highway. 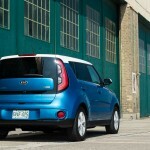 Kia Canada prices the Soul EV from $34,995, before taxes and additional dealer fees. What a lot of people aren’t aware of is the fact that these full-electric vehicles often qualify for hefty rebates from the provincial government. 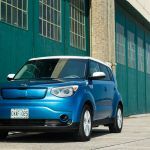 As of this writing, this EV incentive program can net you $8,500 back, depending on the term of your lease (a minimum 36-month term is what’s needed to get the most back). This dramatically changes the game and makes the Soul EV look a lot more interesting to those who have the appropriate lifestyle. 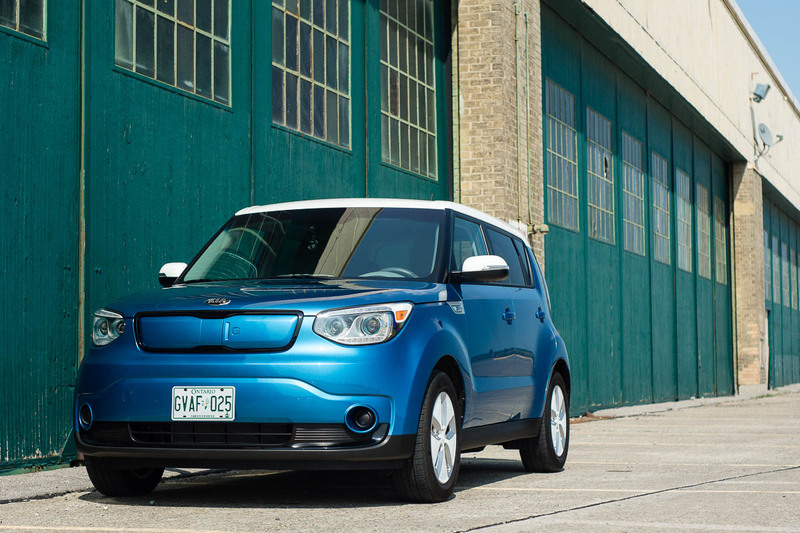 As tested, this Soul EV could cost you as little as $26,495, if you get the maximum amount back, before you add taxes and other fees. There are two different trim levels offered: the base Soul EV (tested here) and the Soul EV Luxury. 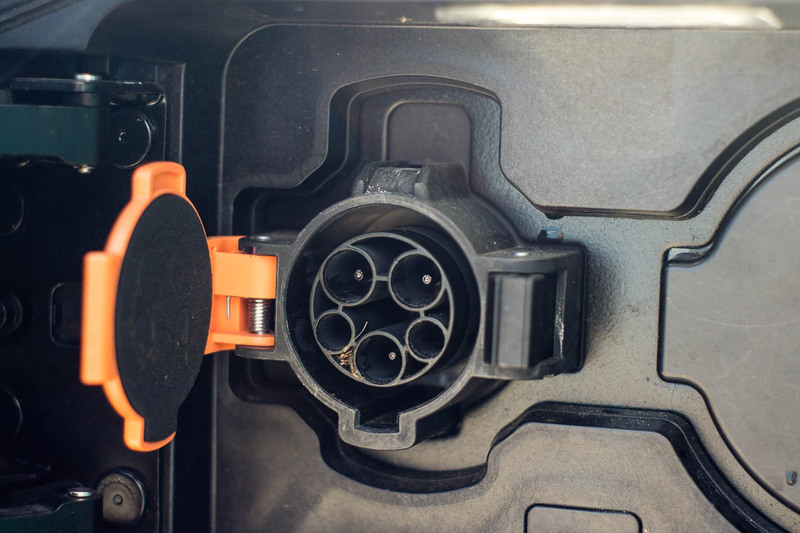 Even the base model is fairly well equipped, but the EV Luxury adds a second charge port alongside the standard 120V/240V outlet. This (more proprietary) outlet accepts a 480V input that can charge the battery from zero to 80% in just 33 minutes – very practical. 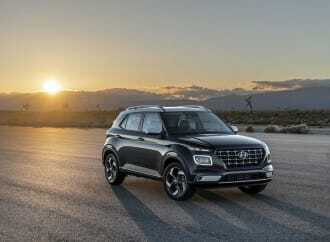 The EV Luxury also adds synthetic leather seating (heated and cooled), fog lights, power-folding side mirrors, and front/rear parking sensors (to supplement the standard reverse camera). 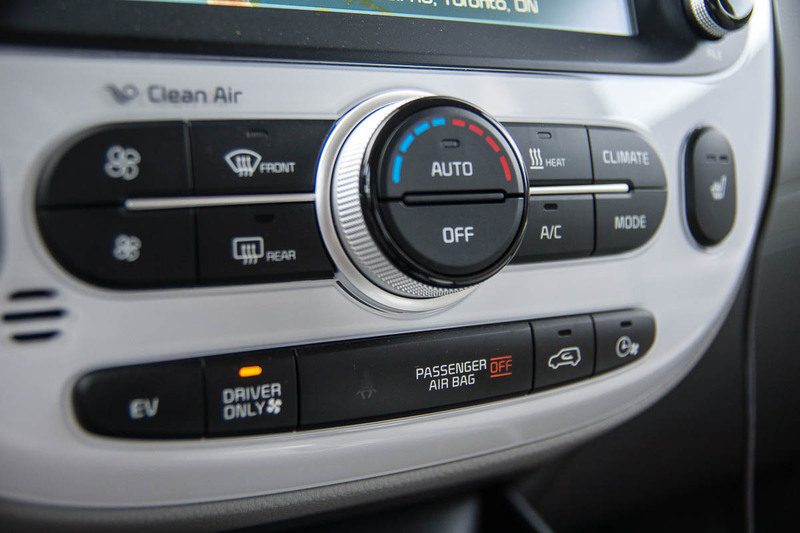 For colder climates, the EV Luxury also adds a heat pump, allowing for more efficient climate control in the winter. 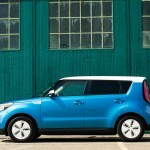 The Kia Soul EV really impressed me, because Kia took a very conventional (albeit funky) gasoline-powered vehicle and completely retrofitted it to accept a pure-electric powertrain. Many other electric cars (like the Nissan Leaf and Tesla Model S) are designed from the ground up to be completely independent of gasoline. With improved battery and electric technologies on the horizon, the increased flexibility that is coming may be worth thinking about. 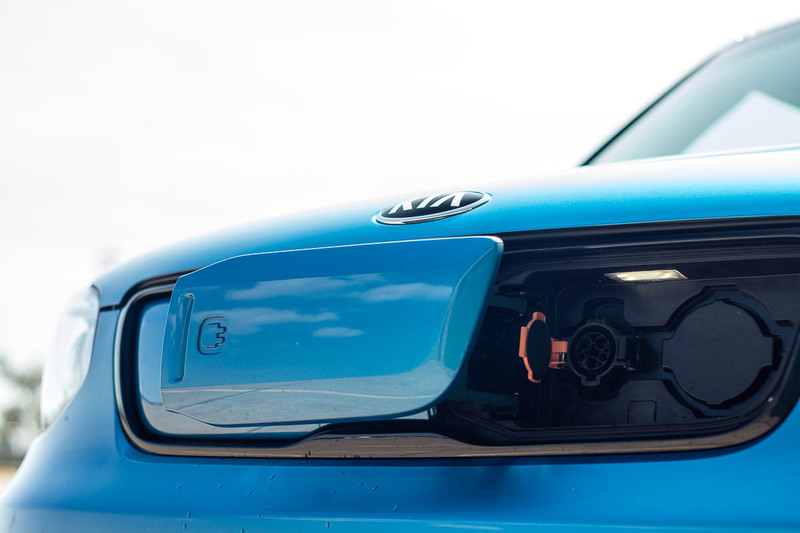 For all intents and purposes, Kia has succeeded, because the Soul EV brings to the table a fantastic blend of all-electric motoring with very little compromise. The only real thing to keep in mind for Canadian customers is how the overall range will be affected in the middle of the winter. 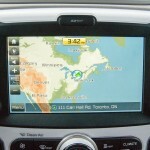 Your mileage may vary – literally. 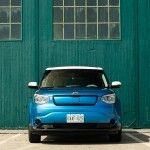 The biggest question one needs to ask themselves is: can an all-electric BEV fit into your lifestyle? As it is now, with people still so dependent on gasoline, the answer may be no. 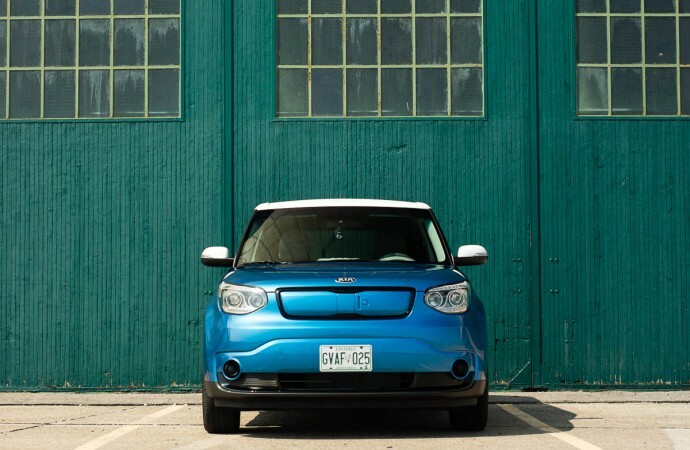 For a select few, the Soul EV may just work. It’s this group of people that stand to benefit the most.